The Hazelnut Praline egg is a dark chocolate Easter Egg decorated with a silver shimmer. It is filled with smooth nutty pralines made from caramelized hazelnuts, flaked almonds and smooth dark chocolate, topped with roasted hazelnut nibs for a crisp finish. Our Easter eggs are handcrafted by our 2 chocolatiers in our artisan chocolate factory in Pelaw. Each half shell is 'double moulded' by hand to create a thick double layer of chocolate. The artisan chocolates are all made by hand too, and the centres are enrobed on an antique enrobing machine. 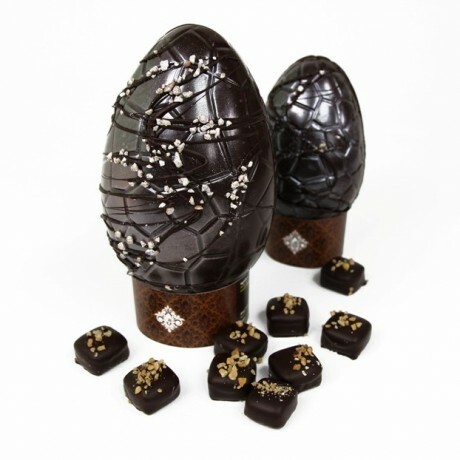 The eggs are beautifully wrapped in cellophane with satin ribbons, and the are chocolates are sealed inside a thick chocolate shell made from our house couverture. Our packaging is minimal and conscious of sustainability. Using only a few grams of cellophane, instead of a plastic box, we drastically reduce the use of pastic, and our cardboard base and tag are fully recyclable. 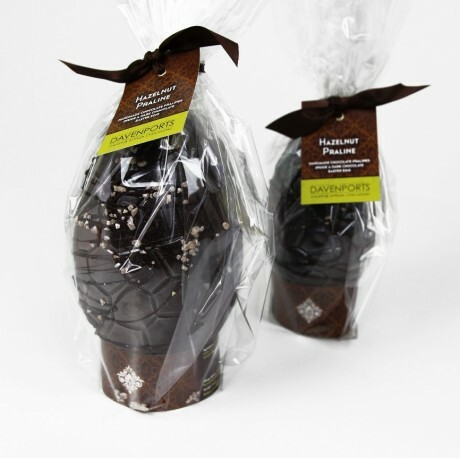 Davenport's Chocolates are a boutique artisan chocolate-maker, established over 10 years ago, and with a great passion for creating chocolates that will make you happy. We really hope you enjoy them! 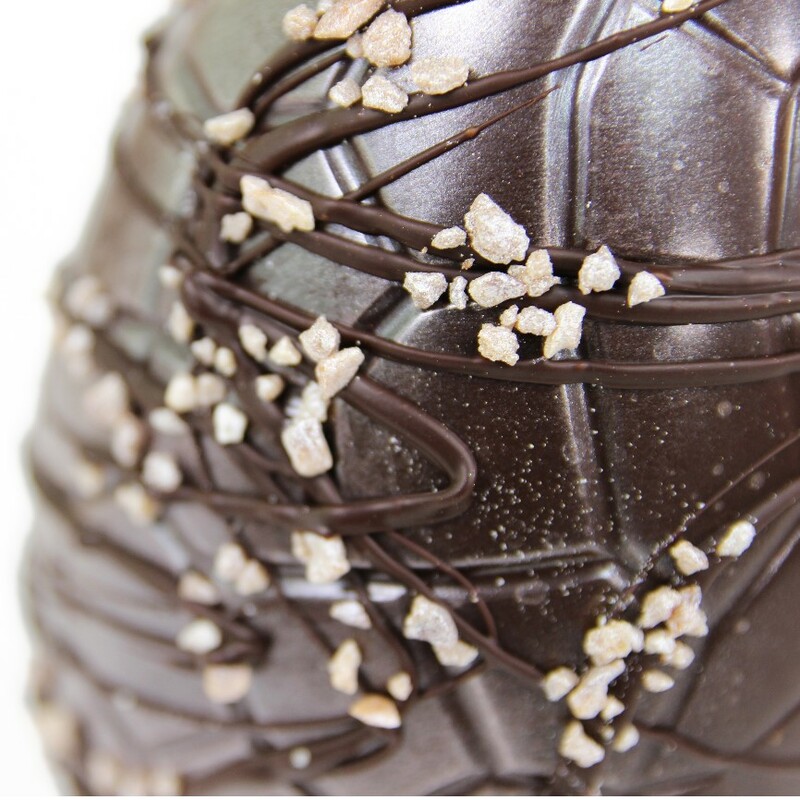 Please note that we list this as a dairy-free, vegan easter egg to reflect the ingredients we use. However, this is still made in our small boutique factory, where other allergen ingredients are used, so please do not order this product if you have wheat/dairy related allergies. Thanks. Dark Chocolate (Cocoa Mass, Sugar, Cocoa Butter, Emulsifier: Soya Lecithin, Natural Vanilla Flavouring), Praline (hazelnuts, sugar), Almonds, Caramelised Hazelnuts, Colour powder with mica, E171. Contains: nuts, soya. Eggs are made in a factory that handles ingredients with milk, wheat and peanuts. 220g egg: Per 100g: Energy 1828.2kJ, Energy 436.6Kcal, Fat 28.7g (Of which saturates 16.2g), Fatty Acids Monounsaturated 10.2g, Fatty Acids Polyunsaturated 1.1g, Trans Fatty Acids 0.0g, Carbohydrate 36.9g (Of which sugars 34.7g), Fibre 6.2g, Protein 4.2g, Salt 0.01g, Sodium 3.1mg. 350g egg: Per 100g: Energy 1878.8kJ, Energy 448.7Kcal, Fat 29.7g (Of which saturates 17.0g) Fatty Acids Monounsaturated 10.3g Fatty Acids Polyunsaturated 1.1g, Trans Fatty Acids 0.0g, Carbohydrate 37.5g (Of which sugars 35.3g) Fibre 6.4g, Protein 4.3g, Salt 0.01g, Sodium 3.2mg.